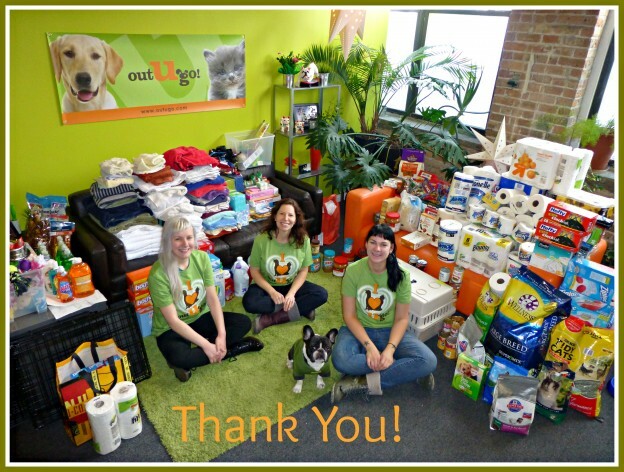 Chicago & Oak Park Hands to Paws Donation Drive another Huge Success! Big Wags and Thank You to all our wonderful Pet Parents! You did it again! We had the honor of delivering your gifts of food, supplies, toys, money, and more to Chicago Canine Rescue and Animal Care League. Your participation in our Hands To Paws Holiday Donation Drive means so much to the dogs & cats and to the volunteers at the shelter who love them! Thanks for helping us make the holidays a little brighter for those pups and kitties awaiting their forever homes! Learn more about Out-U-Go!’s mission to give HUGs and support the people and places finding forever homes for pets in need. This entry was posted in Chicago Catch, Oak Park Pupdate and tagged adoption, animal shelter, charity, fundraiser, Hands For Paws, homeless dogs, HUG, pets, shelter on January 29, 2014 by Laura Rumage.